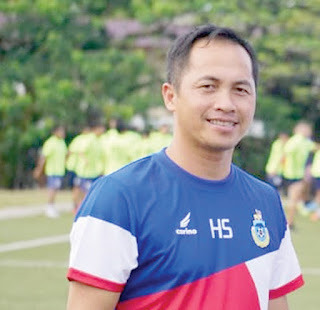 KOTA KINABALU: Sabah Tambadaus will be given a stern test in their three friendly matches against Super League teams in the Peninsula starting tonight (Wednesday). They are set to play Melaka United tonight and tomorrow (Thursday) at Stadium Hang Jebat before finishing their tour against PKNS FC at Stadium MBPJ Selangor on March 23 with all kick-off times at 8.30pm. Twenty-four players are listed for the tour and all are expected to play to see how each will perform in the tour, according to team manager Henry Saimpon (pic) on Tuesday. “Jelius will likely put out his usual first 11 tomorrow night against Melaka United while the reserves and those who have yet to see action since the start of the season may get to play against the same opponents on Thursday. “For the final match against PKNS, we will try to put out the best combination based on the previous two matches in Melaka,” he said. “I believe these three matches will be very good for the team not only for the coaches to get the best combination but also to maintain the team’s current good momentum with the long break before the next match,” he added. He also said the matches will provide them the real picture of how they fare against Super League teams and also to prepare them to face any of the top tier teams if they managed to progress further in the Shopee FA Cup competition. Meanwhile, Brazilian import Luiz Carlos Junior is not with the team for the tour as he is still recovering from his thigh injury. Players who are on the trip are Rozaimie Rohim, Robson Rendy Rining, Mafry Balang, Rawilson Batuil, Dendy Lowa, Muhammad Mohd Safar, Mohd Azizan Nordin, Alto Linus, Melky Balang, Jenius Karib, Randy Baruh Samson, Justin Samaan, Mohd Azwan Abd Fattah, Ricco Nigel Milus, Maxsius Musa, Elias Sulaiman, Sabri Sahar, Rahman Shah Marajeh, Stanely Sulong, Mazlan Yahya, Ranilson Batuil, Park Tae Su, Rodoljub Paunovic and Luka Milunovic. Sabah’s next league match is against Penang at Likas Stadium on March 30 followed by the FA Cup second round match away to Kelantan United FC at Stadium Sultan Muhammad IV, Kota Bharu on April 3.